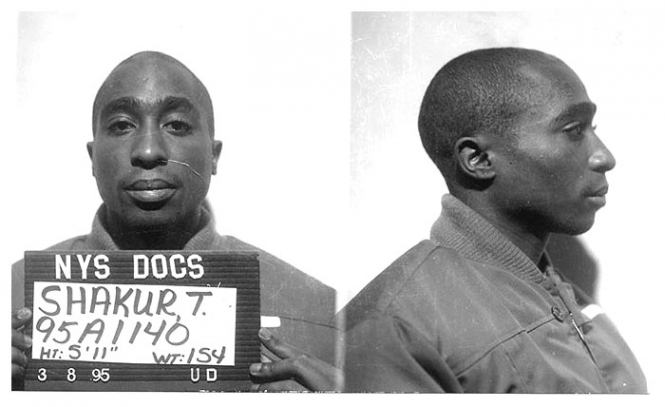 Tupac Shakur was photographed by the New York State Department of Correctional Services in March 1995. The rap star, convicted in December 1994 of the felony sexual abuse of a female fan, spent a few months upstate before being bailed out by producer Suge Knight. Shakur, who was sentenced to 1-1/2-to-4-1/2 years in the can, was murdered in September 1996. Submitted by Watsons Pills on Wed, 2011-04-06 01:02. Can anyone speak English anymore? I will wait for translation. Submitted by Hoosier Daddy on Mon, 2010-08-23 12:14. Submitted by cutie8 on Tue, 2011-01-11 19:46. Submitted by fanoffans on Sun, 2010-10-10 23:40. Submitted by franktherabbit on Mon, 2010-11-29 13:36.